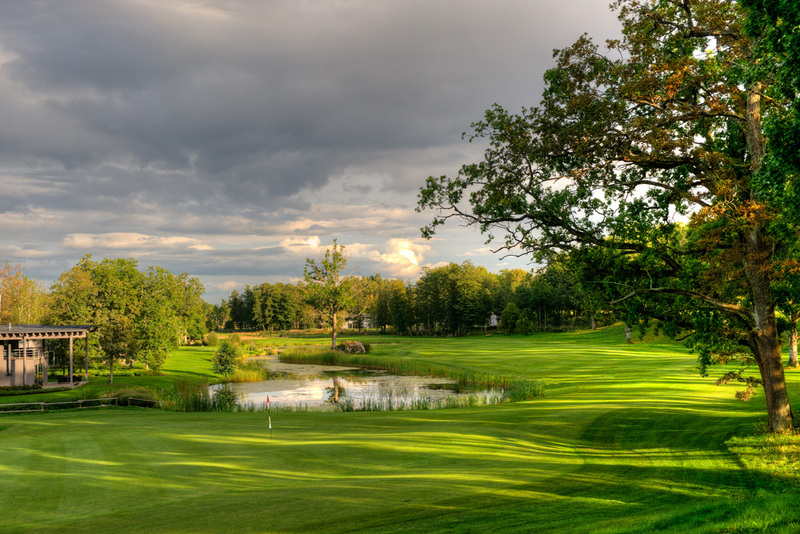 The Estonia Golf & Country Club is our first port of call on our trip to sample what Estonia and more specifically Tallinn has to offer the more intrepid golfer who wants to explore new golfing territories. 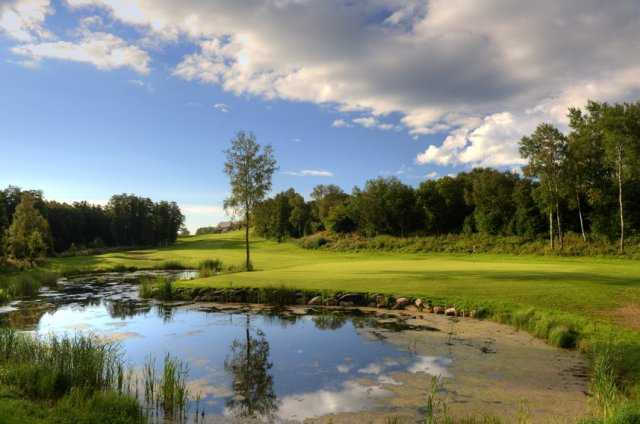 30 minutes out of Tallinn, the ultra-modern clubhouse which draws its architectural inspiration from traditional Estonian barns, sits on top of a limestone ridge, and offers panoramic views over the Bay of Finland, and its densely pine forested shoreline. On this top level there is a 9 hole inland-links style course, which will soon be extended into an 18 hole course. Even on a bright sunny day you get the feeling that you are really exposed to the elements here, and will be given a sound beating as soon as the lightest of wind blows up. 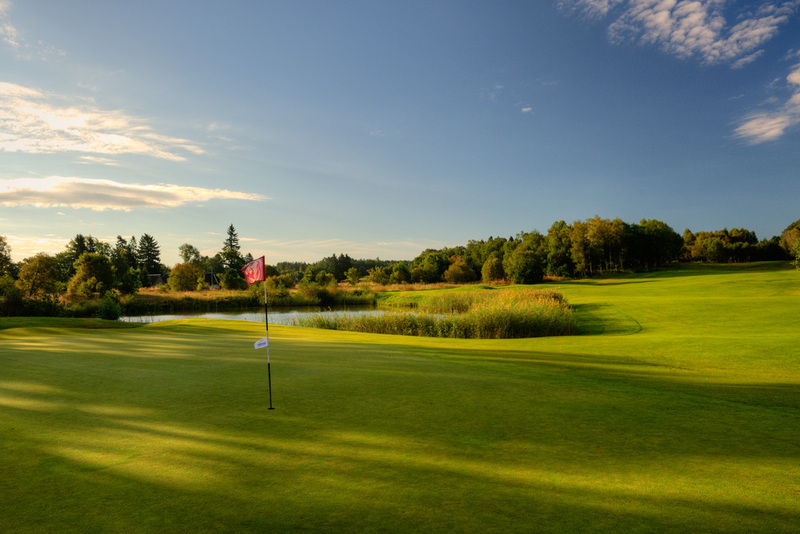 The 9 hole Stone Course is so named because it is carpeted with ancient burial stones, which are all strictly out of bounds to respect the dead who once inhabited the pre-historic fishing village that was originally on this site. It gives the place a strange sense of other-worldliness. The Sea Course is the Championship Course. 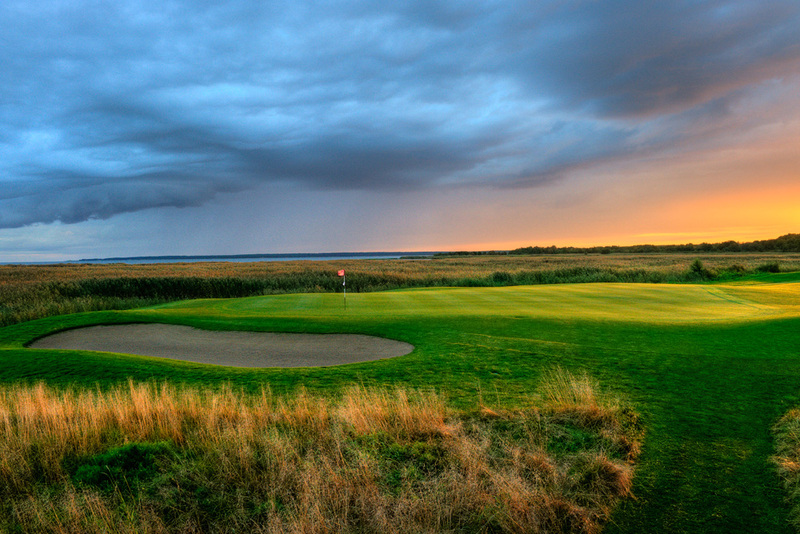 Opened in 2005, and designed by Finnish born Lassi Pekka Tilander, it measures 7,066 yards off the tips. Thankfully it sits below the limestone ridge, so as soon as you walk down from the Clubhouse to the first tee you feel the wind come off your back and a sense of calm descend. 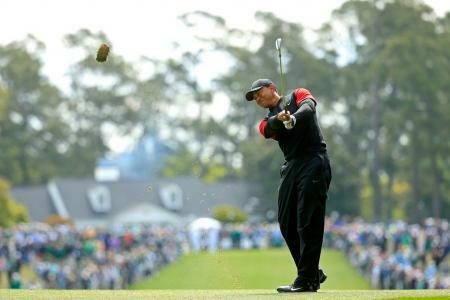 The first is a 530 metre Par 5 Stroke Index 3 hole, so you have to be on your toes from the word go. The opening three holes take you down from the top of the ridge to the sea shore. There is a change in elevation of over 40 metres in this descent, which makes for a really varied land and golf-scape. The seashore itself is masked by a vast marsh of tall bulrushes. It feels more like the coast of Georgia or North Carolina than what one would expect of Estonia and the Baltic. 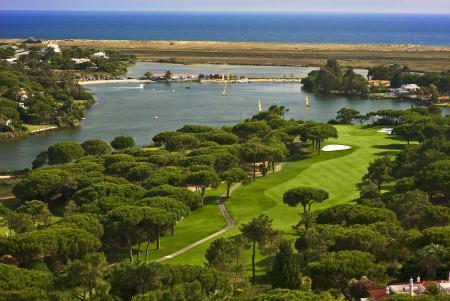 The view from the third tee is spectacular, and the hole a lovely short, descending, Par 4 of 350 metres. The greens are uniformly excellent, and really hold the ball. But I do notice an unusual number of unrepaired pitch marks, leaving any of which you’d expect to be at the very least keel-hauled at most UK clubs. Our golfing guide, Pepe, tells us that they are without doubt the unfinished work of visiting Finish golfers, who don’t apparently always treat the course with the respect it should be due. As Estonia had a turbulent 20th Century with invasions by both Germany and Russia, you sense an understandable wariness of outsiders. Not that Pepe isn’t all charm and light; but he does tell us that there is certain Finish arrogance towards Estonians, whom it appears they view as their poor distant cousins. The course now makes it away across the open flat lands by the coast, with the stroke index 14th, a long par 4 with a tight fairway and water to the left and right. A 156 metre par 3 follows, which is in my opinion the least interesting hole on the course. But what I am actually struck by is how individual all the other holes are, and just how mature the course is despite being only 5 years old. It really feels as if they haven’t actually had to do that much to turn the natural landscape into a top quality course. The course continues to weave its way back up the hill before again descending for the back nine loop, which ends in a tough 526 metre Par 5, which is uphill all the way. And then back to the top of the ridge, and into the clubhouse for a pint of Kiss – Estonian Pear Cider – or Saku, one of the local lagers. I’m clearly not the only one to hold the view that this is a top course, as it made into Golf World’s Top 100 European Courses in 2009. This recognition clearly gave everyone at the club a massive burst of pride and with that the determination to keep improving the club and course, and evangelising how good it is to a still unknowing world. I came to Estonian with little real expectation, but I’m delighted to be leaving with the thought that I will come back here and play it once again. It will be worth the journey. 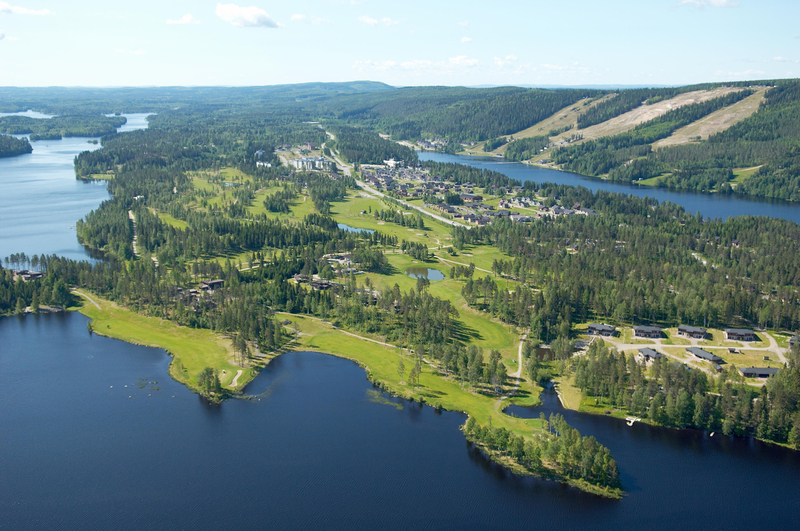 GolfPunk goes in search of golf, beer and nice people in Finland!